Known as 'harvester ants' , members of the genus Pogonomyrmex have long been known to collect a wide variety of seeds, grass spikelets, and other plant parts - but the list of potential food sources for these ants is much more extensive than this. Many (but not all) Pogo species store a considerable amount of the gathered seeds in granaries, deep within the nest. These reserves probably serve the ants well during times of drought, and other periods when colony seed-intake is low. Evidence suggests, however, that at least for Pogonomyrmex salinus in central Oregon, the winter season (when the ants are dormant) is entered with very little, or no seed reserves. Apparently these ants do not build up a store of seeds in the fall, for winter consumption . The exact manner in which Pogonomyrmex ants consume the seeds and other solid food items they harvest/scavenge is not a well-documented aspect of their biology. Since the actual consumption of this varied menu takes place within the subterranean confines of the nest, is not readily observable under natural conditions. It is a well accepted fact that adult ants cannot consume/digest solid foods. The larvae of these and other ants, can, however, so much of this solid material is undoubtedly fed directly to these developing members of the colony. Exactly how the adults tap this nutritional resource is less clear. Many ants around the world share the life habit of gathering seeds (and related plant matter in many cases), and (along with Pogos) are referred to as harvester ants. These various species are often not closely related to one another, and the degree to which they rely on harvesting (and the particulars of their foraging/harvesting methods) vary greatly. The bulk of these harvester ants are members of the Subfamily Myrmicinae, and include species in the following genera: Acanthomyrmex, Apheanogaster, Messor, Monomorium, Pheidole, and others. A few species in the Subfamilies Ponerinae and Formicinae are also considered to be harvesters. Like Pogos, most if not all of these other harvester ants also act as scavengers, and sometimes predators. NOTE: This is only a partial list of harvester ants - see reference works for more info. Some species alternate in their reliance on seeds, as opposed to other plant parts, depending on the season, and availabilty of particular resources. In many cases, ants that have evolved the ability to exploit other major food sources, such as seed harvesters and those ants that cultivate fungus, seem to rely less on symbiotic relationships with sugary-secretion-providing insects (trophobionts) - even though they (the ants) may belong to sub-families in which these trophobiotic behaviors are highly developed. 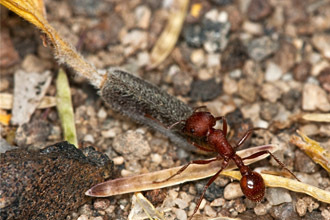 Many ants (including those of the sub-family Myrmicinae, to which Pogos belong) can store liquid or liquefied food in the crop where it can then be shared among colony members through regurgitation, in a process called trophallaxis (this process also involves the transfer of chemical information between members of the colony). It appears that trophallaxis does not play a major role in Pogonomyrmex colonies, and some species have apparently done away with it completely. We have not seen trophallaxis occurring in the Pogonomyrmex salinus workers we have observed. ·Taber, S.W. 1998. The World of the Harvester Ants. College Station, TX, Texas A&M University Press.